Sometimes you just want to get away from it all. But before you do, make sure you are well-prepared! We love exploring, especially the wild places that offer a serene tranquility away from it all. Sometimes, though, we get too far away. And that's when tranquility turns into bewilderment. So pack a map and take some tips from Wilderness Navigation by Mike and Robert Burns. Note: The purpose of Wilderness Navigation is to PREVENT you from getting lost. So one should already have a good grasp of using maps, compasses, and other navigation tools already before setting out on a trip. And if you are not proficient in navigation skills, a brief list of tips does NOT suffice as proper training. Stay safe! Better to go on lots of adventures than be on your last adventure. Most wilderness orientation, navigation, and routefinding is done by simply looking at your surroundings and comparing them to the map. This process is often aided by making some navigational preparations before the trip, like identifying handrails, baselines, and possible routefinding problems. For example: If the shore of a large distant lake always lies west of the area you will be in, you can be sure that heading west at any time will eventually get you to this identifiable landmark. Heading toward this baseline may not be the fastest way to travel back home from your destination, but it may save you from being truly lost. It is wise to prepare a route plan: a well-thought-out description of how you will find your way to your destination and back, including handrails, baselines, trails, topographic features you will be following, and other aspects of your proposed wilderness trek. It is also a good idea to highlight the entire trip on a topographic map. will be following on the way to your objective. Part of this plan is to recognize potential routefinding problems. For example, if the route traverses a large, featureless area, you may need route-marking materials, particularly if the weather outlook is marginal. Be sure to carry such materials if your route plan indicates a possible need for them. Make a note of any escape routes that can be used in case of sudden bad weather, injury, or other setbacks. note them on the map. 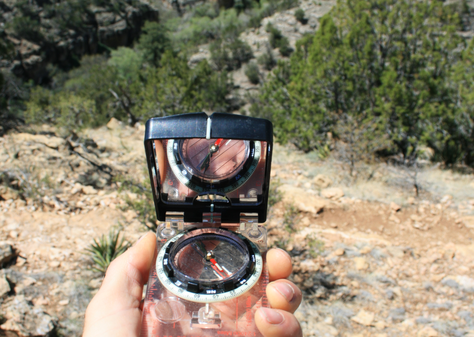 It is certainly possible to measure map bearings at any point in the trip, but it is easier and sometimes more accurate at home on a desk or table, and it might save you time in an emergency. inexperienced persons) to carry whistles. what route you are taking, and when you plan on returning. Assign a responsible, experienced person to be the rear guard, or “sweep,” to ensure that no straggler will be left behind or lost. If your party is indeed lost? The first rule is to stop. Resist the temptation to press onward. The moment you are ever unsure of your position, you should stop. hour or so, retrace your steps and get back on route. But if that spot is hours back, you might instead decide to head toward the baseline. If it begins to look as though darkness will fall before you can get back, you might have to bivouac for the night. If so, start looking for an adequate place, with water and some sort of shelter if possible, well before dark. And finally, as the old phrase goes: "Most climbing accidents happen on the way down." In almost every case, a trip goes wrong when people are overconfident, or take on more than they are prepared for. So remember, just because you have a good idea of what to do, one should still practice under experienced guidance before embarking into the wild. Excerpted from Wilderness Navigation (Mountaineers Books, February 2015) by Mike and Robert Burns. To learn more about navigating the wilderness, make sure to pick up your copy today.